WIN! 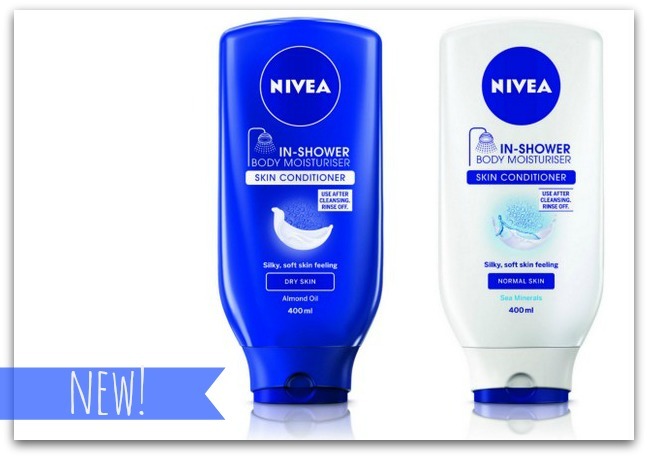 2 Hampers of NIVEA Goodies Including New In-Shower Body Moisturiser! Did you know that six NIVEA body products are sold EVERY SECOND around the world? It’s true! NIVEA Body Care is celebrating its 50th birthday in 2013 with one of the most exciting body launches of the year. NIVEA In-Shower Body Moisturiser is an innovative product that is applied in the shower and then rinsed off, just as you would a hair conditioner. A real-time saver for those busy mornings and last-minute dates & party plans! The lazy girl's best friend (eh, that would be me, then! ), NIVEA In-Shower Body Moisturiser is so easy to use – just apply after using your usual body wash product, to deliver caring properties with moisturisers and oils that your shower gel just can't provide. The lush, creamy formula is activated by water, so it absorbs immediately into the skin for extra hydration. Just slap it on in the shower, wash it off, dry yourself, get dressed and go! To celebrate this exciting launch, Fluff and Fripperies has two hampers of NIVEA products to give away which include the new In-Shower. This one is open to the island of Ireland only - just pop your details into the widget below for your chance to win. Good luck, everyone! Love Nivea products especially the in shower moisturiser. Great prize. ooh sounds lovely (& lazy) love cheat products like this! Great stuff! Good luck everybody! Nice one, Love nivea it's so lush. you can't go wrong with Nivea! Nivea take up half my bathroom. Good value products. I've been meaning to try this out, sounds perfect for lazy body moisturisers like myself! I have been itching to dry the in shower moisturiser! Thank you! I am the ultimate lazy girl! Nice prize. I'm intregued by these products but haven't tried them yet. Another great prize - thanks so much and fingers crossed! I am curious to try this after seeing it in Boot's. Nivea products never disappoint! Nivea was so named after French for skin - niveau. They certainly tick all the boxes for their moisturing properties reliability and affordability! This looks gorgeous, just what I need for my winter skin! Really like Nivea products, they are really good quality and affordable... Not sure I'd get the same level of moisture from an in-shower product, but definitely worth a try!!! Lovely giveaway! Would love to try the In-Shower moisturizer! Perfect for the upcoming colder weather!